We dedicate this blog and our professional time to designing and developing the freshest, newest, and highest quality custom wallpaper available. So much time on the front end is dedicated to commissioning a custom wall mural, from selecting the right imagery to considering it's effect on it's audience. Custom wallpaper project dimensions should also taken carefully and deliberately. Once the mural is printed and finished, we package the wallpaper with utmost care to ensure it will be safe during shipment. With all of this attention and caution taken to procure your custom wallpaper, the last thing you need is for an unqualified wallpaper installer to damage the wall mural in a botched install. To avoid this, we always recommend that our clients seek the aid of a professional wallpaper hanger through the National Guild of Professional Paper Hangers (NGPP). NGPP members adhere to stringent professional and ethical guidelines. Additionally, the NGPP offers insurance programs and other benefits to their members not always readily available to the self-employed. For the homeowner, the NGPP offers a link on their website to locate a wallpaper installer. Search by zip code and locate a qualified installer as well as their contact info and web address if available. One stand out member shown above is Glen Olsen. He is a member of the Chicago Chapter of the NGPP, find their chapter website here. 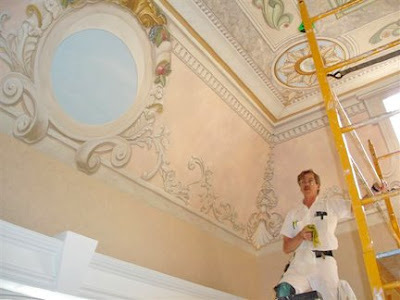 Glen is shown here installing a custom ceiling mural designed by Pam Carron. It was a complicated job involving numerous sections and contour cut wallpaper elements. However, as a veteran wallpaper hanger, this dedicated member of the NGPP came through for us, the artist and the client, and we couldn't recommend Glen and his fellow guild members more.